After months of internecine squabbling between the different factions of Theresa May's conservative party, it appears the prime minister might finally be close to securing a deal that stands a chance of winning parliamentary approval, thanks to a major concession from the European Union. If a report in the Sunday Times is accurate, May has assembled a detailed "secret" Brexit plan that, among other details, would kill off the controversial Northern Ireland "backstop" that had become the main obstacle to further negotiations. Working in secret, May has reportedly developed a detailed, 50-page plan for a Brexit treaty that will allow the entire UK to remain within the EU customs union - that is, until a final deal can be hammered out during the transitionary period, which Brexiteers fear could mean "forever". As part of the new "secret" deal, May has effectively scrapped most of her controversial four-page "Chequers plan", and replaced most provisions governing the single market and customs union with an agreement to hash out a "Future Economic Partnership" - essentially an open-ended agreement to continue negotiations that leaves open the possibility of reaching a free trade deal like the one enjoyed by Canada, a provision that is bound to appease at least some of the Brexiteers. The word on the street in Westminster is that part of the plan "could have been written by Jacob Rees-Mogg," the leader of the hardline Eurosceptics, which, if true, would signify a major victory for May. In another major concession allowed by EU chief negotiator Michel Barnier last week, the EU is apparently prepared to accept that regulatory checks on British goods can be trusted to happen "in the market" - ie at the British factories where they are produced - instead of at border checkpoints. May is hoping to discuss the plan with her cabinet on Tuesday, and hopes that it will receive enough support to at least warrant the EU calling for a special summit in late November to hammer out the final details. The EU will write an all-UK customs deal into the legally binding withdrawal agreement so an EU-designed “backstop” treating Northern Ireland differently from the UK mainland is not required. There will be an “exit clause” to convince Eurosceptics the UK will not be in it for ever. The FEP will outline how a new trade deal would balance market access and border checks, making clear that a deal along the lines of the EU’s arrangement with Canada is still a possible outcome as is May’s Chequers plan for close alignment. Of course, given how badly negotiations had deteriorated, May was effectively forced to take her negotiations covert to stop the non-believers from undermining her. But now that she has won these concessions from the EU, she is finally in a position to do some browbeating of her own. Telling Brexiteer ministers that unless they support it, they will be personally responsible for causing a no-deal Brexit, which most regard as a potential disaster. Telling remainers that May fought for the closest possible alignment until the last minute, but that the negotiations mean Britain will not be a full member of the customs union for ever. Not admitting in public that she has ditched her Chequers blueprint, but signalling privately that she will allow a “pivot” towards a different “landing zone” for the final deal. But given the amount of control they have exercised over the process thus far, the Brexiteer faction might be unwilling to relinquish their leverage and blindly accept the deal, thanks to fears that the final agreement (which still would need to be hammered out at the hoped-for November EU summit) might contain a well-hidden provision to keep Northern Ireland more closely tied to Brussels if the rest of the UK were to leave the customs union. One anonymous Whitehall source quoted by the Times spelled this out in no uncertain terms. A senior Whitehall source added: "The PM will be able to say there’s no more backstop, we’ve got rid of that - success. It is UK-wide - success. There’s an exit mechanism - success. And you’ve got Canada. The small print is that Ireland is f**ked." Oddly enough since the negotiations for the deal were reportedly carried out in secret, the Brexiteers have already begun to flesh out a strategy for possibly countering it - or at least ensuring that they are not forced into going along with the deal by threats of a "no deal" Brexit, or, worse, cooperation with Labour. In an editorial published in the Sunday Times, former Brexit Secretary David Davis demanded that May authorize her attorney general to release to parliament any legal advice prepared for May's cabinet. Davis even went so far as to warn that, if May were to refuse, she would risk the same fate as Tony Blair, who famously refused to publish the advice of his attorney general about the legality of joining the US war in Iraq. When the advice leaked, revealing that the attorney general had doubts about the legality of the war effort, Blair's reputation never recovered. The upshot is that Brexiteers are looking for assurances that the UK's stay within the customs union will be temporary, and that there will be no chance of the Brexit Treaty remaining intact after the transition period ends at the beginning of 2021. "We need the cards laid on the table so that we can form a judgment. Is the future of the union at stake? Are we being hurtled towards a Hotel California Brexit where we can check out, but we can never leave?" 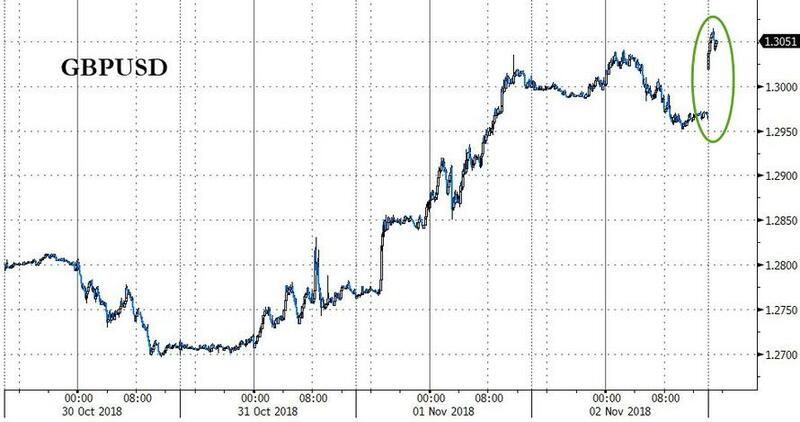 Though they've been subjected to a series of false dawns in recent weeks, cable traders still embraced the news, pushing GBP higher on the hope that a "no deal" Brexit might be averted. While the EU held its ground on concessions like allowing all of the UK to remain in the customs union for months, the fact that Barnier & Co. finally caved isn't all that surprising. After taking into account the massive headache that a 'no deal' Brexit would create for the EU economy (which is already being threatened by the potential for a debt crisis in Italy) as well as the UK Brexiteers' willingness to blithely accept such an outcome, Barnier must have finally realized that only he had the power to make the difficult choices necessary to create a deal. But then again, as we've seen time and time again with these seemingly interminable negotiations, no deal can safely be considered 'done' until all necessary approvals have been secured - a scenario that is still a long way off.